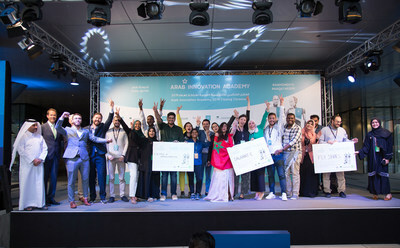 The second edition of the Arab Innovation Academy (AIA), a collaboration between Qatar Science & Technology Park (QSTP) - part of Qatar Foundation Research, Development and Innovation (QF RDI) - and the European Innovation Academy (EIA), concluded with a grand pitching and graduation ceremony at QSTP on Tuesday, January 15. AIA is the first and largest entrepreneurship program in the region, aimed at equipping entrepreneurs in Qatar, the MENA region, and the global community with the skillset to build their start-up in just 10 days. The accelerated mode of experiential learning introduced participants to cutting-edge methods and tools in entrepreneurship, from team formation and idea creation to pitching to venture capitalists and angel investors. During the competition, participants developed and launched new tech ventures in a real marketplace, with genuine customer feedback. AIA 2019 first place winner was team 'Salamat-e', who developed a mobile app that serves as a 'health passport'. The app is connected to GPS, and contains information about epidemic diseases in the region of a particular travel destination, as well as prevention methods and necessary vaccinations. 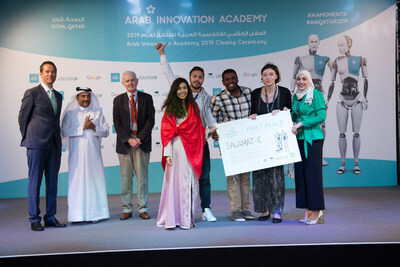 The team is composed of Bashar Shawar from Palestine Polytechnic University; Chaimae El Mahdaoui from Mohammed VI University of Health Sciences, Morocco; Polina Ladchenko from Higher School of Economics, Russia; Tareq Osman Babiker from Al Neelain University, Sudan; and Yafa Abd AlRahim from Birzeit University, Palestine.